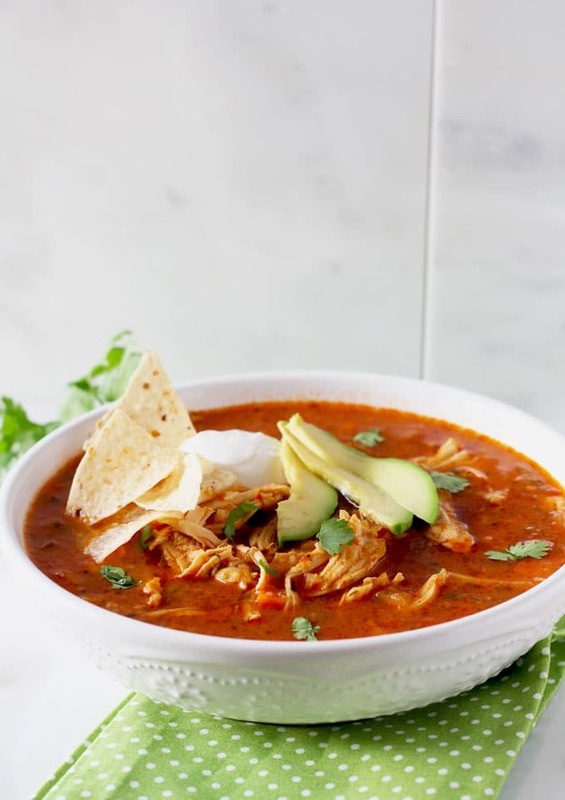 You are here: Home / SOUPS AND STEWS / Chicken Tortilla Soup ~ Everyone’s Favorite Soup! 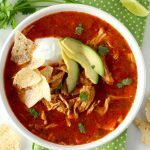 Chicken Tortilla Soup ~ Everyone’s Favorite Soup! 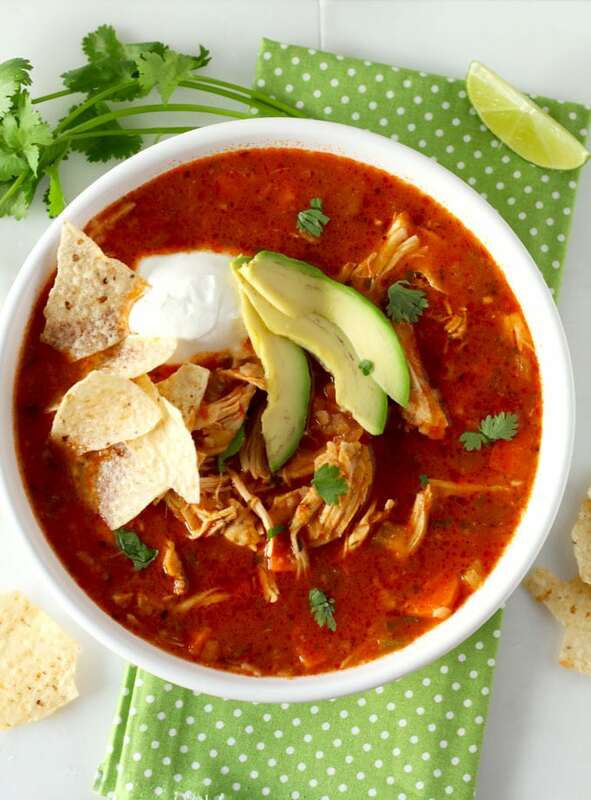 This Chicken Tortilla Soup is beyond delicious. 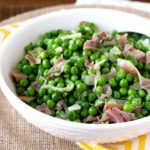 It’s healthy, flavorful, easy to make and a complete meal. Especially if you add all the amazing toppings ~ who doesn’t like to pile up on toppings? 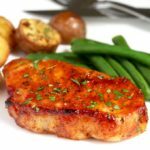 Years ago while living in Southern California, I used to have a gourmet foods business. I was lucky (and blessed) to partner with a dear friend and marketing genius who shared with me a passion for all things food and wine. We decided to sell our offerings at local farmers markets (the cool place to shop on the West Coast). Our product line consisted of a few gourmet sauces, cookies, brownies and some interesting snacks. After a few weeks of success with our line, we decided to introduce to-go-soups into the menu. This chicken tortilla soup was by far our best seller! I would shop, prep and cook like a mad woman and Dani would jar, wrap, seal, pack and beautify! We will wake up at the crack of dawn and drive a couple of cars full of merchandise through the canyon all the way to a very “hip and celebrity packed” market! Some mornings were freezing cold (that would be 68 degrees by California standards), but we always had a great time. We really had the best looking stall at the market and we even dressed the same! The biggest issue we had was keeping the soup available for purchase for more than 30 minutes! We were always sold out no matter how much we made! It seems like the more I made, the faster it would go! Seriously exhausting you guys! Anyway, back to the soup. Big shreds of chicken, aromatic vegetables, crushed tomatoes, amazing spices…. all thickened by corn tortillas… yum! I’m about to eat my keyboard! 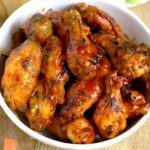 It’s super easy to make and the results are amazing! 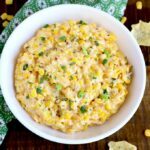 To take it to the next level of yum, the toppings ~ shredded cheese that will melt as soon as they touch the soup, sour cream or Mexican crema, tortilla chips (feel free to crush them and pour them all over). Top it all off with some creamy ripe sliced avocados and some more cilantro and you’ve got yourself a meal!! All soups are better if made with homemade chicken stock. Here’s the recipe for my Basic Chicken Stock. 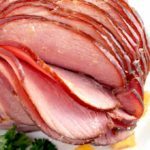 You can always use canned stock if you don’t have any homemade. How much salt should you use for this soup? 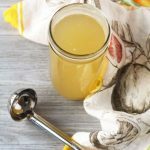 Taste your chicken broth first and go from there! Is it salty? salt free? low sodium? You can always add more salt at the end! If you over salt just, don’t panic! just add more broth. How much I love Dutch ovens? Too much!! They come in all sizes and prices. If you can get a Le Creuset Enamel Cast Iron French (Dutch) Oven go for it! You will thank me later! Other budget friendly options like this Lodge Enamel Cast Iron Dutch Oven or this Cuisinart Enamel Casserole are also available! 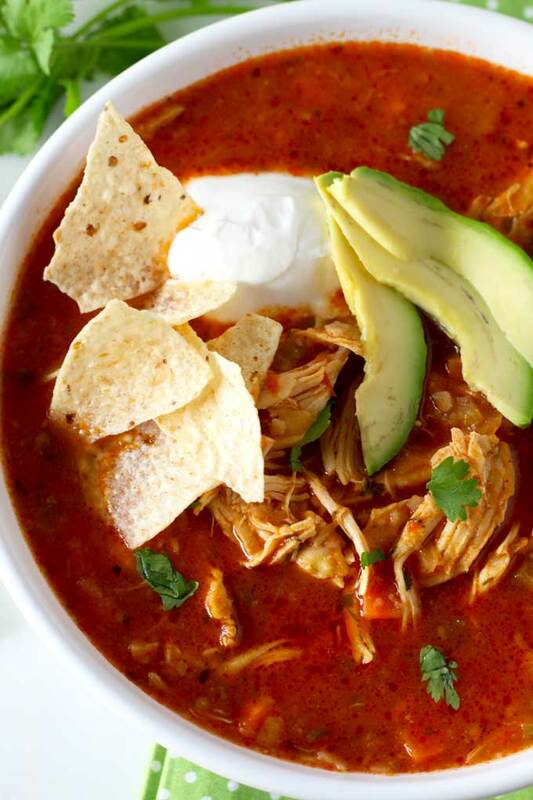 This Chicken Tortilla Soup is beyond delicious. 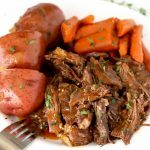 It's healthy, flavorful, easy to make and a complete meal. Especially if you add all the amazing toppings! This soup is truly everyone’s favorite! On a sheet pan place the chicken breasts skin side up, rub with olive oil and season with salt and pepper to taste. 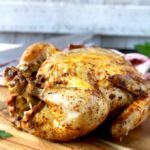 Roast the chicken for about 35 to 45 minutes or until cooked through. Remove from the oven. When your chicken is cool enough to handle, shred the chicken discarding the skin and the bones. Reserve until ready to use. 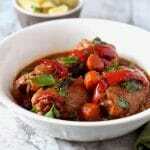 In a large pot or Dutch oven, heat up 1 tablespoon of olive oil over medium-high heat. Add the onions, celery, carrots, green bell pepper and jalapeno. Sautee for about 8 - 10 minutes or until the onions become translucent. Add the garlic and cook for another 2-3 minutes. Lower the heat to medium low and add the oregano, cumin, coriander and about 1 tablespoon of salt (the amount of salt you add depends on the saltiness of your chicken stock). Mix well. Add the crushed tomatoes and chicken stock. Bring to a boil. 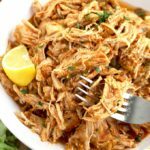 Add the shredded chicken, tortilla strips and the fresh cilantro. Reduce the heat to low and simmer for 25 – 30 minutes. Season to taste with salt and pepper. Serve the soup hot, top with sour cream or Mexican crema, shredded cheese, sliced avocado and tortilla chips. Garnish with lime wedges and chopped cilantro if desired. 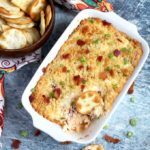 I just finished making this recipe. My hubby really wanted me to make it. It is delicious! 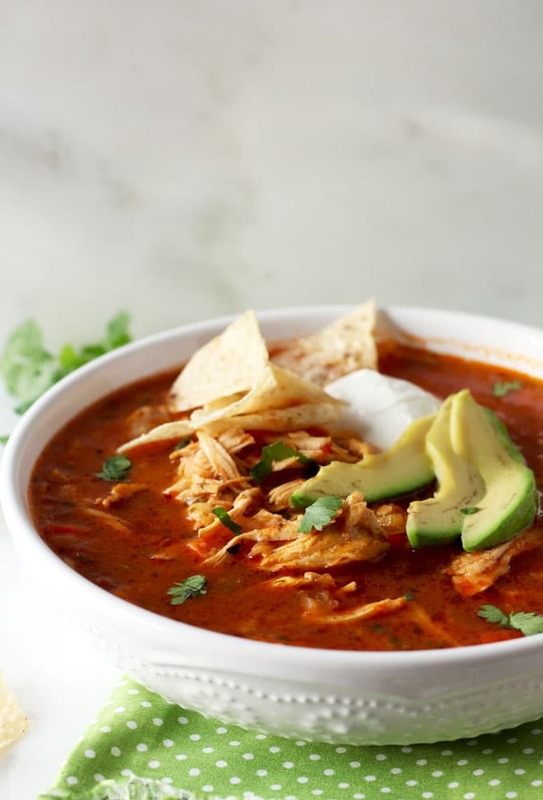 It is easy to make and everything tortilla soup should be. Great recipe. Thank you so much for the feedback!! I am glad you guys like it!!! Hugs! Made this last night with some chicken left over from a burrito bowl recipe (so it had rice, beans, & corn mixed in too). 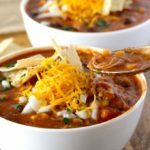 I also like tortilla soup but often find it bland when I make it at home. This is not that! Very flavorful, the sweetness of the carrots cut the spice from the jalapeños, but still leaves enough spice & a hearty broth based soup! 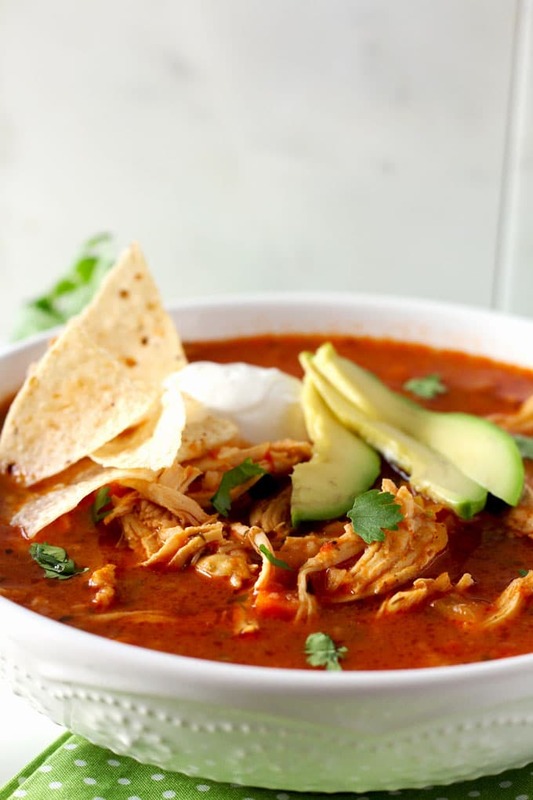 I am saving this for every time I have leftover chicken or just crave tortilla soup. Thanks for the recipe!